Land reform poster As is true with all land, farm land is owned by state in China. In the Mao-era most farming was done at collective farms and state farms. Food produced by farms was sold to the state at fixed prices that were generally lower than the prices of the same food sold on the open market. As a result the farms were dependent on government subsidies to remain afloat. Agricultural productivity was low. Farmers lacked incentives to be productive; infrastructure and transportation problems prevented food from getting from the fields to people's homes before it spoiled; poor land management exhausted soils and water supplies. There were also weather problems. The low productivity resulted in shortages and even famines. To increase productivity, chemical fertilizer plants were built, hybrid-seed programs were developed, insecticides were used, rivers were irrigated. Many of these programs had negative effects on the environment. During the war to take power, the Communists promised land to the poor. When the Communists came to power they began seizing land from landowners and distributing it among the poor. Each family got no more than 1.3 acres. Land owners that resisted giving up their land, even as little as two thirds of an acre, were often executed. 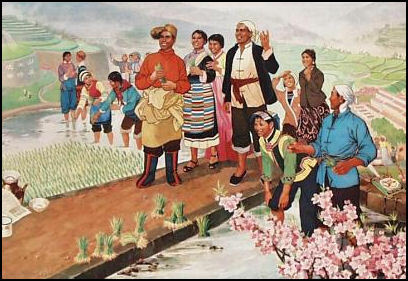 The Communist Party’s greatest legacy arguably has been taking land from wealthy landlords and rich farmers and redistributing it in rural areas among the poorest peasants under the principal of “land of the tiller.” During the war to take power, the Communists promised land to the poor. When the Communists came to power they began seizing land from landowners and distributing it among the poor. Each family got no more than 1.3 acres. Land owners that resisted giving up their land, even as little as two thirds of an acre, were often executed. After 1949, farmers classified as "poor peasants" by the Communists were given ownership to land taken away from local landlords and rich farmers. Estates and large farms were divided and peasants got small parcels of land. One farmer told the New York Times, "Of course we were extremely happy---everyone was happy we got land!" Top down economic plans after independence bore fruit. The national income rose at rate of 8.9 percent a year between 1953 and 1957 bu created problems down the road. Giving peasants usages rights rather than ownership paved the way for the seizures of land by local officials and businesses that is taking place today. In the early 1950s the Communists helped form mutual aid teams, the precursors to cooperatives. In 1955, Mao decreed that all farmers should "voluntarily" organize into large cooperatives. The cooperatives were overseen by party cadres and large portions of the output was turned over to the state. 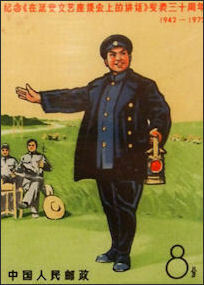 In the early 1950s, in one of the largest peacetime mobilizations in history, prisoners of war, decommissioned Red Army soldiers and “reform through labor” convicts were sent to the Gobi Desert and western China as members of the Xinjiang Production and Construction Corps, to build roads, canals, bridges and dams and transform a wasteland into a rich agricultural area of cotton, maize and rice, complete with its own cities. In some cases the condition were so sever that participants made furniture from sod bricks and used their own hair keep arm in the frigid winters. Large centrally planned People’s Communes were established in late 1950s. The Communists had hoped that collectivism would help the huge Chinese population feed itself, but collectivism did not increase agricultural production. Within a short time it was clear this system wasn’t workable. Distribution was always a problem. 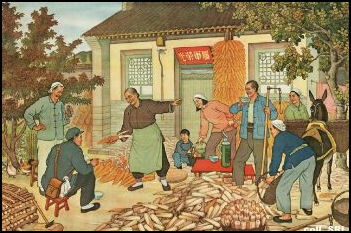 Even during the Cultural Revolution when every able-bodied person in the country was put to the task of rasing food, food rotted in the fields and people starved. In the 1960s and 70s, the land in effect belonged to a production team---made up of 20 to 40 households---whose members were compensated in shares of the collective harvest by a complex system of shared points. Collectives were cooperative organizations in which farmers joined together to collectively raise crops on land worked in common. The farmers were paid in food (grain, vegetables, milk and meat) and money earned by the collective. Sometimes the term collective farm and commune was used interchangeably. A commune is a groups of many cooperatives. A typical one embraced 60 villages and 20,000 members. All buildings, tools, machines, land and dwellings were owned by the commune. People worked in teams of 150 to 600 people and were paid a small wage a given clothing, food and housing. A typical rural Chinese family working on a agricultural commune earned about US$700 a year. Communes were intended to function like small cities or towns. They had their own manufacturing capabilities and worked farmers like factory workers and kept people from migrating to the cities. If needed people on communes could be mobilized for large labor-intensive projects. State farms were "factory type" farms that specialized mainly in one kind of crop or one kind of animal. They were set up and run by the state. Workers are treated the same as factory workers and paid a regular salary. 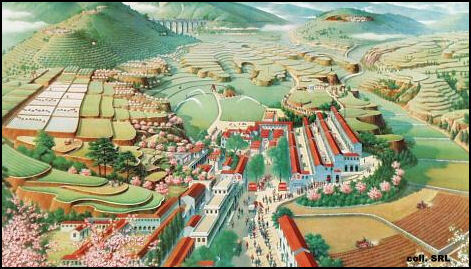 Some collective farms in China were massive. "That commune was so large," one saying went, "that the person has to take a train to see the head of the committee." During the Cultural Revolution, some collective farms doubled as Chinese gulags for intellectuals and political prisoners. Some 26,578 communes were established by 1958. One of the largest, State Farm No. 128 of the No. 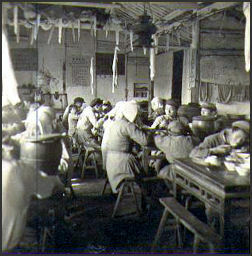 7 Division (85 miles northwest of Urumqi) employed 17,000 people (almost all Han Chinese) and had military-style checkpoints, irrigated orchards and cotton fields as well as its own foreign affairs office, television station, oil refinery and enterprises for marketing crops and forestry products. The Dazhai Commune in Shanxi province was one of the most famous communes in China. Reportedly built up from the ruins of great flood by 500 peasants, it boasted record grain productions and it provided a model for other communes across China. Over the years Danzhai was visited three times by Zhou Enai, twice by Deng Xiaoping as well as by Queen Beatrice of Netherlands, Pol Pot from Cambodia and leaders from Africa, Albania and East Germany. Later it was revealed that Dazhai was a sham. The record grain reports were fiction, production figures were exaggerated and the commune was subsidized. According to one writer, "Nowdays to many people the whole thing about Dazhai looks like a joke." Authority for collective farms was determined by national laws or by rules drawn up by the collective farm. Each collective was run by a chairman-manager and board made up of Communist party loyalists theoretically elected by members of the collective. The collective farm chairman controlled all the resources and incomes. Collectives, state farms and communes were often very inefficient. They often had armies of administrators, bookkeepers, veterinarians, dentists along with farmers that often wouldn’t hit the fields until 11:00am and sometimes did the threshing and winnowing by hand when their machines broke down. Workers who followed the Soviet model worked in units called brigades or links that were directed brigade or link leaders. They often worked in teams of "labor-day" units, with certain tasks regarded as requiring more labor than others. A day of harvesting for example might be worth a whole labor day while a day of milking might be worth only half a day. Workers "earnings" were drawn against their future "income" of labor days. At the end of each labor day units were tallied up by the brigade or link leader. At the end of the year, earnings and labor days are added up. If there was a surplus of labor days, a workers might receive a bonus of some sort. Collectives provided education, housing and transportation. Workers enjoyed a lifestyle similar to that of industrial workers, receiving paid vacation and social benefits such as maternity leave, health insurance, pensions and access to cultural events and continuing education. At communes and collectives the traditional family system was broken down. Some people slept in dormitories and ate in mess halls. Children were cared for in day care centers so their mothers could work. Old people were placed in special dwellings called "happy homes." To escape from this system many commune residents lived in small single-story brick houses they built themselves. Chinese peasant were generally allowed to have pigs and garden plots to raise food for themselves but not to sell. commune life in the 1950s Workers typically worked eight or nine hours a day and had weekends off. Sometimes when there was a lot of work to do they worked on the weekends. A typical day began at 5:00am when loudspeaker woke everyone up. After roll call, calisthenics and breakfast of dark bread and grits, people worked in the fields. Around 12:00noon the workers took a break for lunch, which was often made in a barn near the fields and served to workers near where they were working. It often consisted of stew or borscht served from a common pot served with potatoes, black bread and salted pork. Work usually ended around 5:00pm. Dinner was served around 6:00. If there was time workers often worked their family garden plots. For entertainment there were self-criticism sessions, propaganda films, discussions of Marxism and gatherings and singing parties held in the collective’s recreation hall. The work was often very tough. A woman told him, "After giving birth to first son I still had to keep working, making shoes for the soldiers, twenty shoes everyday for the soldiers. I kept my son in the corner and had to keep working." On first arrival to collective farm, one peasant told National Geographic, "We came here in March, walking from Urumqi. Nine days. We shot wild pigs and wild sheep for food."